I got an interesting chance to be part of a bloggers part , organized by Preethi Appliances, a renowned Home and Kitchen appliances brand. 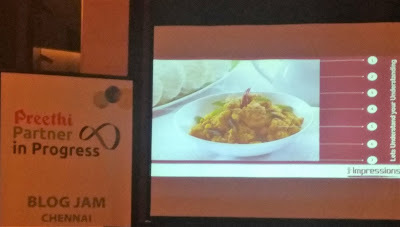 The event was called "Blog Jam" and in process learnt quite a bit about namma Chennai's very own Preethi Brand. The agenda primarily included a mini blogging workshop by a food blogger and the second session was about photography for food blogging (I learnt some seriously great insights, tips and tricks on the second session in particular). Having done Marketing as my core specialization in my post graduation, I have always taken keen interest in "Domestic" brands that has given a good fight against the internaitonal and national brands which generally comes with deep pockets. Be it a Cavin Kare or a Preethi, there has been quite a number of brands from Chennai which have capitalized a large national market share and won the David vs Goliath war in marketing. Preethi is a very example of such a beautiful brand that has etched a deep emotional connect with every Chennaiite across all generations. Brand "Preethi" has an unbeatable stronghold in the kitchen appliance market in South India with more than 30% market share in the 1000+ crore grinder / mixer / juicer market. The quality of the products spoke volumes about the brand and became a synonymous name in every household. Having started around 1978, they gained significant popularity around the late 80's and is remained on top for the past 30 years. 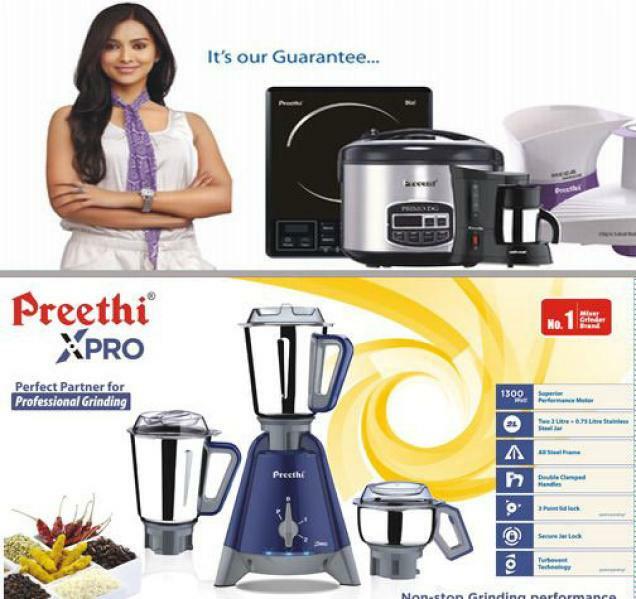 In fact, it's quite to suffice to say that the market of wet grinders and mixers were pioneered by Preethi. It's almost hard to any find house that may not use a Preethi product one way or another, esp in states like Tamil Nadu (base of their operations), Kerala, Karnataka and Andhra Pradesh. One of the reasons for their share of success was also attributed to the "Preethi ku naan guarantee" (Translated : I can guarantee for Preethi anyday) ads .Till day, the elderly people in everyone's house swears by the brand and wouldn't tolerate any other brand being operated in the kitchen. The fierce loyalty is something hard to acquire & probably every brand would be dying to get. They however couldn't find similar success up north , with other national/international brands having more dominance. Though this didn't stop their ambitious plans to expand to other Asian, Middle eastern countries . In 2011, they were acquired by Philips . Being a Home Appliance leader , this acquisition kinda made perfect sense to their product line . They might as well be a "Home & Kitchen" Appliance leader. However, on a surprising note, I had absolutely no idea that this acquisition had happened, given that the two brands (Preethi & Philips) were kept separate since the start, primarily for the brand name each carried in their own space. Competition in most of the products was primarily restricted to other unbranded products or city based brands that didnt put much of a fight. Their primary target audience was woman, though not confined to them, given the actual buyer is the head of the family . Interestingly, their ads not only appealed to the older generation of women, but also the modern independent woman who wanted an appliance that could get all her cooking needs done in a flash, without any compromise on quality. 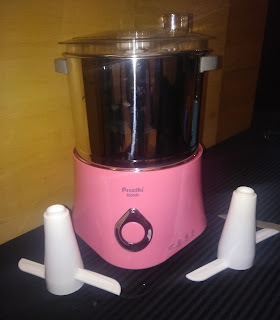 Preethi's main foray was in Grinders , Mixers , Juicers, Glass Stoves and the recent foray in Induction cookstops as well. Other products include Mini Mixies/choppers called Turbo Chop & Rice cookers. Preethi Iconic was also one of the key highlights of this workshop. A mini "Table top" grinder that adopts a pyramid cone structure for the blocks inside while doing a reverse grinding. The company here claims 0 wastage, 50 % less space for storage and more importantly saves additional 30% of the nutritional stuff. Approx cost was roughly 8000 INR from my understanding. To be fair, I happened to see the product on display and witnessed a mini demo , though never got the chance to personally try it out nor can provide a expert comment on its actual performance. 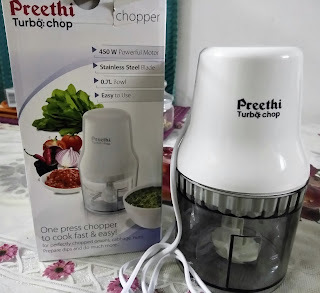 No I didnt get to go on a chopper ride , but rather got a chance to try Preethi's Turbo Chop vegetable chopper or sometimes even referred to as #PreethiMiniMixie. (Disclaimer: I have never come close to even remotely cutting vegetables and this was the first time personally using a vegetable chopper). The event had a mini 2 hr session on photography for Food Blogging by Chef Umashankar Dhanpal. 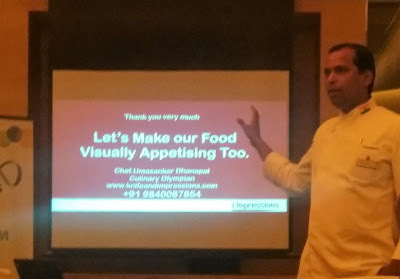 Theme was primarily on how to make the presentation of a food, visually appealing especially while shooting for a magazine or blogs , websites etc. I never knew that the components of a food, background, depth , colour and even a simple smoky effect could drastically improve the quality of the picture being shot. Do check out my review of the recently launched Philips AirFryer here. I use the Turbo Chop every day. It is easy to chop ginger, garlic, curry leaves and onions into fine pieces. Perfect for rava upma and akki rotis where I need to cut more than one onion!